I was blessed recently to have been invited to participate with a small group of fellow-pastors in a two month reading and discussion of Timothy Keller’s textbook on church ministry, Center Church: Doing Balanced, Gospel-Centered Ministry in Your City . It was a blessed time, not so much for the book itself, as these things often go, but for the privilege of hanging out with men aiming to do ministry well. I had some reflections on the book to share at our last meeting, but, sadly, I got called away and was not able to be a part of that final discussion. So, I post those thoughts here as an open letter which may, perhaps, be helpful to more than just that temporary ‘band of brothers’ now dispersed. I hope I am correct. I’ve enjoyed the sessions we have spent over the past few months reading and discussing Keller’s book. I am honored to have been invited to participate, feeling quite often as the ant among the giants. I’ve been blessed. As we conclude I wanted to make a simple observation and plea: that as helpful as Tim Keller has been to all of us and as insightful and comprehensive as Center Church is, if it is read alone in isolation, it can be harmful in its effect. That is, Tim Keller should never be read without a healthy balance of Eugene Peterson (or others who, like him, champion the pastoral call). 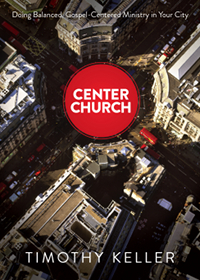 Having finished Center Church, some, as I do, may feel overwhelmed. The complexity of leading a church with wisdom and vision in our current age may be within reach for some, but it is overwhelming to ordinary pastors like myself. One can be moved by reading this to reconsider many of our practices, to implement significant redirection, and possibly to even move to the city. But one also might be moved to quit, to give up ministry altogether, crushed by the sheer weight of all the pieces to be held together to stay centered. It is because of these tendencies that I believe Peterson needs to be kept close as a healthy counterweight and antidote. Those of us who have read Peterson’s The Contemplative Pastor know that he takes a cautious if not disdainful view of the idea of ‘running’ a church. He acknowledges that the institution needs to be managed – that a certain amount of ‘running’ a church is inevitable and necessary. But if running a church overwhelms the primary pastoral callings then something monumental has been sacrificed. It is easy to allow that to happen. There is no one doing a better job of helping pastors think through the maze that “running” a church is than Tim Keller. Someone must lead, decisions must be made, the institution must be governed. And yet, is that the primary pastoral call? 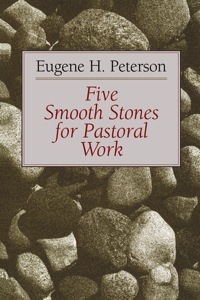 Peterson challenges that notion with a relentless drum beat calling pastors to pastoral ministry, to the time consuming realities of prayer, of preaching, of listening, of community building. As a pastor I live with a very real tension. I want to grow a church and I want to use all the tools at my disposal for doing so, even though, truth be told, the motive for this is a volatile mixture of concern for the glory of God and the health of my own resume. At the same time I’m tugged by the compulsion to sit with people, to hear their stories, to be with them when they are suffering, and to challenge them when they are wandering. I understand that there are those (though, thankfully, not among us) who believe that the idea of ‘shepherd’ is a harmful metaphor for thinking about pastoral ministry. I’m puzzled by that – as I see myself as primarily a shepherd. Peter Wagner once distinguished between pastors who are shepherds and those who are ranchers. I’ll never be a rancher; Peterson never aspired to be so. He resolved to never pastor a church in which he could not know the name of every member. I’m of that school, and so either by gifting (or lack thereof!) or calling or conviction or the humbling hand of God, I’ve come to the reality that I will always pastor relatively small churches, and those churches will, more likely than not, NOT be in the city. And I want to say, on behalf of the vast majority of pastors for whom this will be true, that this is not only okay, but that it is GOOD. Keller should be read, but NEVER without Peterson, or someone like him. Not by those who feel that being a good shepherd is still the primary call of pastoral ministry. Glad Peterson has been helpful. But don’t NOT read Center Church! Very helpful stuff – but potentially off-setting if not read in tandem with an author who values ‘mere’ pastoral ministry.